See my full cv <here>. I am an oceanographer and in broad terms, I am interested in studying general ocean circulation and anthropogenic climate change using numerical ocean models and coupled earth system models. I also enjoy studying geophysical fluid dynamics, stratified fluid dynamics, laboratory experiments on internal gravity waves and programming. My Engineering Bachelor’s degree in Computer Science has immensely contributed to my personal and professional development by giving me opportunities to work on advanced research problems. During my undergraduate studies, I worked on projects like the development of a automated wireless surveillance system and using computer simulation to study behavior of computer networks. These opportunities led me to the fascinating field of numerical modeling in which we employ mathematical models which are basically a network of computer programs that use discretized mathematical equations to predict the behavior of a complex system over time. An example would be the Earth’s weather system. After receiving my Bachelors degree, I joined the Indian Institute of Science (IISc) in India to work as a Project Assistant at the Center for Atmospheric and Oceanic Sciences (CAOS) to gain knowledge and experience in the fascinating field of Oceanography. I chose to shift to a completely new field because Oceanography combines my two favorite subjects, applied physics and numerical modeling to study fascinating and important mathematical problems in Earth’s climate system. I worked on a project to study the diurnal to inter-annual variability of the Indian Summer Monsoon. I also gained sea going experience with this project on the O.R.V. Sagar Kanya, a deep-sea ocean research vessel, as part of a multi-year study of response of the upper ocean to tropical cyclones in the Bay of Bengal. These experiences led me to get a Masters degree in Physical Oceanography from Memorial University in Newfoundland, Canada. I got the opportunity to study the largest ocean waves in the world called internal waves. They are named so because they occur in the interior of the ocean, invisible to the naked eye and are responsible for transferring heat, salt and nutrients around the ocean. My masters research was on understanding the energy flux of internal wave reflecting off continental shelf topography with my supervisor, Dr. James Munroe. The experimental set-up and the data processing tools were entirely built from the ground up. This opportunity was both incredibly fun and inspiring. After getting my Masters I moved to the US where I’m pursuing my PhD in Physical Oceanography at Texas A&M University under the supervision of Dr. Achim Stoessel aiming to improve the representation of the high-latitude Southern Ocean in Coupled Earth System Models (CESM). My advisor Dr. Achim Stossel and I are working with the Climate Ocean Sea Ice Modeling (COSIM) group at Los Alamos National Laboratory (LANL). The main goal was to study processes associated with open ocean polynya and their representation in ocean models by analyzing ocean, sea-ice, atmosphere fields from a high-resolution eddy-resolving fully-coupled (ocean-sea ice-atmosphere-land) CESM simulation. These simulations are from the Accelerated Climate Modeling for Energy (ACME). The fully coupled eddy resolving simulation was run for 95 years in a pre-industrial scenario. The ocean-sea ice-atmosphere fields to be analyzed have monthly averaged values for 95 years and daily values for years 35,36, and 37. The first long lasting open ocean polynya is observed in the winter of simulation year 17 in the Weddell Sea (WS) and they occur frequently throughout the run. We compare the data to another simulation with the same model configuration except for a change in the model resolution, which has nominal horizontal resolution of 1° for all model components (ocean, sea-ice, atmosphere and land components). The coupled model was run for 195 years in a pre-industrial scenario. It is important to note that coarser-resolution CESM simulations did not produce any OOP. Our first paper on Maud Rise Polynyas is online here !! The publication is available as open access! Formation of Maud Rise Polynyas in a High-Resolution Earth System Model. J. My masters research was on studying internal gravity waves with my supervisor, Dr. James Munroe. The time I spent here was what made me go for a PhD. Working in a fluids lab is so much fun !! I used Python for all the scientific calculations and data analysis purposes. The early models of the wave generator were built using LEGOs :P We also designed and built the tank ourselves..! and stress tested it using SOLIDWORKS to make sure we wouldn't flood the building. The python package to perform Synthetic Schlieren was also homegrown since we couldn't pay for the commercial software !!! To understand mechanisms involved in the evolution and interaction of internal waves with sloping topography (subcritical,critical and supercritical), we performed a series (LOTS and LOTS!) of laboratory experiments to study the energy flux of internal waves in a continuously stratified salt water fluid. The internal waves were generated by a wave generator that is capable of producing monochromatic, vertically trapped waves (L. Gostiaux, H. Didelle, S. Mercier, and T. Dauxois (2007)). The wave generator consists of a series of vertically stacked plates which are controlled by a camshaft and the camshaft can be precisely controlled to rotate at different frequencies generating internal waves of different modes. These internal waves propagate along the length of the tank (~5m) and reflect off a sloping boundary wall. The slope of the boundary can be critical, subcritical or super critical. The structure and amplitude of the internal waves are measured using a non intrusive flow visualization technique called ‘Synthetic Schlieren’ that enables us to measure the amplitude and energy of the waves (B. R. Sutherland, S. B. Dalziel, G. O. Hughes and P. F. Linden (1999)). 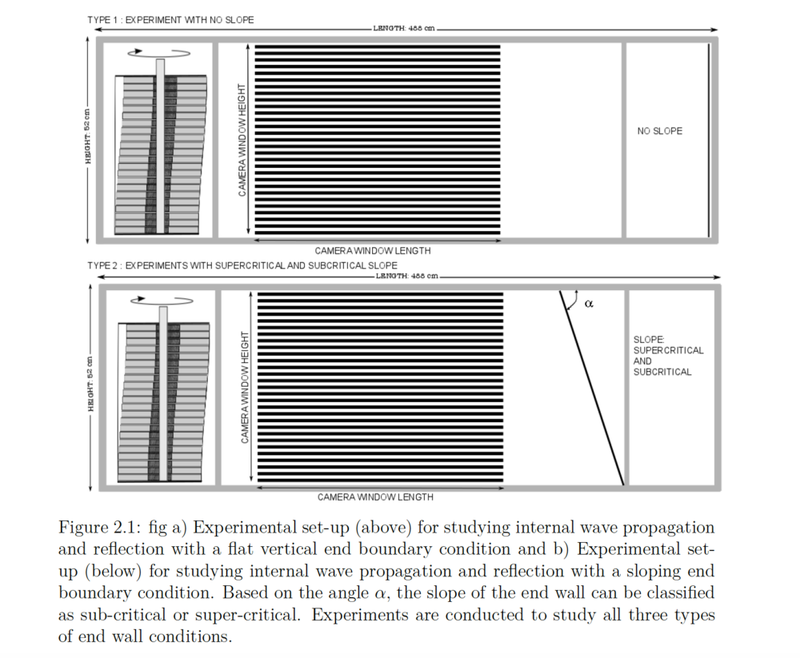 We measured the vertical displacement amplitude and energy flux of the internal waves varying independently the frequency of the wave generator, stratification of the fluid and angle of the sloping boundary wall. Using Hilbert transform we separated the generated waves and the reflected waves to estimate energy from the incoming waves is present in the reflected internal waves (M. J. Mercier, N. B. Garnier, and T. Dauxois (2008)). The analysis of the energy flux of the internal waves during propagation and reflection using the Hilbert transform is helpful as it brings insight into phenomena that are difficult to observe during field studies. I presented the preliminary findings at the 66th Annual Meeting of the American Physical Society's Division of Fluid Dynamics held in Pittsburgh, USA from Nov 24 -26, 2013 (http://meetings.aps.org/Meeting/DFD13/Session/G1.9). Our paper on the research done here is in preparation. Kurtakoti, P, Veneziani, M, Stoessel, A, Weijer, W, Maltrud, M. (2019). Formation and Impacts of Open-Ocean Convection in the Weddell Sea in a High-Resolution Earth System Model. In prep. to be submitted to the Journal of Physical Oceanography. Kurtakoti, P.,Veneziani, M, Stoessel, A,Weijer, W., Maltrud, M. Preconditioning, Formation and Impact of Weddell Sea Polynya in a High-Resolution Earth System Model" Physical Oceanography Dissertation Symposium (PODS) 10'th meeting, Kona, Hawai'i,October 21-25, 2018. Kurtakoti, P.,Veneziani, M, Stoessel, A, Weijer, W. "Preconditioning and formation mechanisms of Maud Rise (open ocean) Polynyas in a high-resolution CESM" 22nd Annual CESM Workshop, Boulder, Colorado , June 19 22, 2017. Kurtakoti, P., Munroe, J. "Propagating and reflecting mode-1 internal waves analyzed using the Hilbert transform" 66th Annual Meeting of the American Physical Society Division of Fluid Dynamics, Pittsburgh, Pennsylvania, November 23-26, 2013. Kurtakoti, P., Veneziani, M., Stoessel, A. and Weijer, W. "Great Weddell Sea Polynyas: Mechanisms for their Genesis and Cessation in a High-Resolution Earth System Model" Ocean Sciences Meeting, Portland, Oregon , February 11-16, 2018. Kurtakoti, P., Veneziani, M., Stoessel, A. and Weijer, W. "Preconditioning and Formation Mechanisms of Maud Rise (Open Ocean) Polynyas in a High-Resolution CESM Simulation" AGU Fall Meeting, San Francisco, California, December 12-16, 2016. Pattullo Conference, September 22-25, 2019, Warrenton, Virginia. Physical Oceanography Dissertation Symposium, October 21-25, 2018, Kona, Hawai'i. Python for Scientists and Engineers, Enthought tutorial, October 2-6, 2017, Los Alamos, NM. 2015 CESM Tutorial, 8 - 14 August 2015, National Center for Atmospheric Research, Mesa Lab, Boulder, CO.